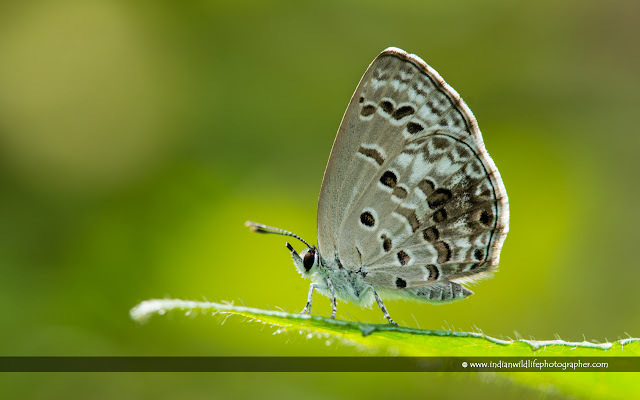 The Lime Blue (Chilades lajus) is a small butterfly found in India, Ceylon, Burma, Taiwan, Hong Kong, Hainan, Mangulam Island, Sulawesi and the Philippines that belongs to the Lycaenids or Blues family. Wet-season form Male has a bluish-purple upperside. Fore wing has base and basal half of costa flushed with pale blue; costa and termen edged by a slender dark brownish-block even line, beyond which along the termen the cilia are brown, at base, white outwardly. Hind wing: costa somewhat broadly dusky black; a slender black conspicuous anticiliary line, beyond which the cilia are white traversed medially by a brown line; dorsum broadly pale brown, two subterminal pale-bordered black spots in interspace 1, and one similar spot in interspace 2, often obsolescent and barely indicated. Underside: grey. Fore wing: a transverse broad lunule on the discocellulars and a transverse discal series of six spots dark brown, the lunule and each of the discal spots edged with white; the posterior four spots of the discal series elongate and each obliquely placed, the anterior two round and curved inwards; a subterminal series of transverse elongate spots with an inner series of lunules dusky brown, both series edged inwardly and outwardly with white; finally, an anticiliary slender black line. Cilia white, medially traversed by a dark brown line. Hind wing: the following jet-black spots slenderly encircled with white :a transverse subbasal series of four and a subcostal spot somewhat larger than the others in the middle of interspace 7; below the latter a catenulated line of slenderly white-edged dusky-brown spots, including the lunular spot on the discocellulars, crosses the wing, and beyond these opposite the apex of the cell are three similar discal spots, the middle one elongate; the terminal markings consist of an inner continuous subterminal series of dusky lunules, bordered inwardly and outwardly with white, an outer subterminal series of inwardly conical dusky-brown spots, and a slender anticiliary black line. The posterior two spots of the outer line of subterminal markings are also black. Cilia white. Antennae black, the shafts obscurely ringed with white; head, thorax and abdomen brown, the head, thorax and base of the abdomen with a little blue scaling; beneath : the palpi, thorax and abdomen white.